According to the recent MCI amendment made to the Post Graduate Medical Education Regulation 2000, all the existing Medical Colleges will have to start PG courses by the academic year 2020-21. Apart from the existing government & private colleges, the regulation will also be valid for new medical colleges and they will have to start PG courses within 3 years of receiving recognition for running undergraduate courses. Medical Colleges in India offering MBBS courses will have to make an application for starting of PG medical education courses within three years of grant of recognition. They will have to apply for new seats for starting PG courses. They will have to put in applications with MCI for offering postgraduate programs, following which council inspection will take place. The colleges will be required to pass this inspection within 3 weeks to stay recognized. Monetary penalty as high as Rs. 10 lakhs can be put on the colleges which do not get their PG courses recognized. They may even be debarred from making further PG applications. MCI has taken such a move to ensure that colleges start PG courses. With the increase in the seats, thousands of students who fail to get admission will now be able to enroll in their dream PG courses. As per the health ministry,’ this will give us more PG seats but colleges will have to apply for new seats. There will be proper inspection and the seats will increase for 2019-20 academic session’. 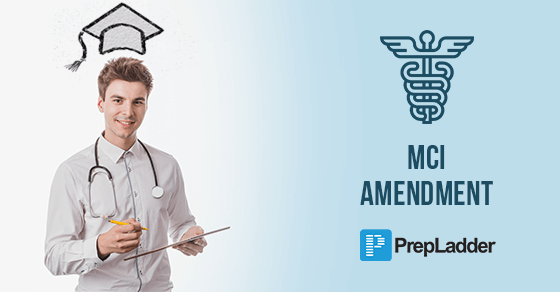 Will MCI amendment benefit Medical students…??? The medical students are surely going to benefit from this amendment. They will now get more chances to grab their dream seats. The move is aimed at addressing the scarcity of doctors in the country. Once the amendment gets implemented, near about 10,000 PG seats would be created over the next 4 years. What do you feel about this amendment…? ?